Fangio y Suixtil – Desde el fin del mundo! Pensar que desde el interior del fin del mundo emergió el quíntuple campeón mundial de automovilismo y figura globalmente venerada. Lo mas curioso es que Suixtil, una marca con presencia internacional, también. Salomon Rudman, inmigrante llegado a la Argentina en la primera presidencia del Gral. Perón, fundó la marca de vestimenta Suixtil y fue sponsor y amigo de Fangio. Es sabido que en sus comienzos lo ayudó a comprar el Chevrolet 1939 coupe con el que Fangio comenzara a descollar en el automovilismo nacional e internacional. Posteriormente conformaron la escudería suixtil y la mayoría de los grandes pilotos de la época (Jose Froilan Gonzalez, Onofre Marimon, Roberto “Bitito” Mieres, Benedicto Campos, Eusebio Marcilla y otros) se vistieron con Suixtil haciendo honor de esa forma a un hombre y su marca que siempre apoyaron al Automovilismo Argentino. From the end of the world ? Think that from the inside of “The End of the World” emerged the five-time world champion racer, and globally revered figure. Another curiously? Suixtil, a brand with international presence, emerged from the same place too. Salomon Rudman, an immigrant who arrived in Argentina in the first presidency of the Gral. Peron, founded the clothing brand Suixtil and was sponsor and friend of Fangio. 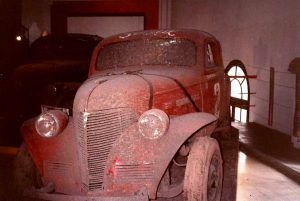 It is known that at the beginning of Fangio´s career Rudman helped him buy the 1939 Chevrolet coupe with which began to appear in races at national and international level. Later they formed the Suixtil team and most of the great drivers of the era (Jose Froilan Gonzalez, Onofre Marimon, Roberto “Bitito” Mieres, Benedict Campos, Eusebio Marcilla and others) started dressing with Suixtil honoring thus a man and his brand that always supported the Argentine motoring. What a great piece! Thanks for mentioning Suixtil (not me I don’t count – but you make me blush.) Having only known about Fangio and the other racing greats from what I’ve read, it is fascinating to speak (via Instagram) with someone to whom these guys were their country’s heros. These were true gentlemen racers, they were not afraid to lift a wrench or lend a car to help another. Imagine the racers and competitors often had dinner together at the end of the race on Sunday, as I’ve heard – the winner bought. Suixtil was born at the beginning of F1 and the glory days of racing, it is an honor to represent a company with such prestigious DNA. I’m humbled.